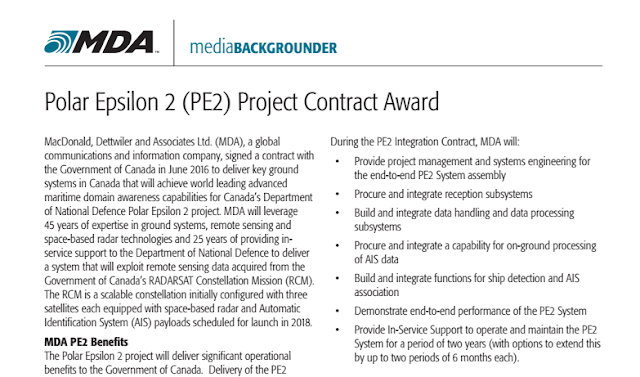 According to its project manager, the question of whether the Canadian Armed Forces (CAF) Polar Epsilon 2 (PE2) program should be within the scope of the 2013 fixed price agreement negotiated by the Stephen Harper conservative government to cover all space and ground operations of the upcoming RADARSAT Constellation mission (RCM) over its first year of operations, is certainly an interesting one. But, at least according to Lieutenant Commander Kabatoss, the current project manager of PS2 and a subject manager expert recommended by the Department of National Defence (DND), "now that we have a determination from DND that the new PE2 contract is outside the scope of the 2013 contract negotiated by the previous government," there is the potential for additional "out of scope" RCM related contracts between now and 2018, when the three satellites which comprise RCM, are expected to launch. "DND has a separate contract for PS2 and we felt the additional charges were appropriate," he said in a recent interview. And those contracts will cost Canadian taxpayers money. As outlined in the June 19th, 2016 post, "Our Space Agency Needs More Astronauts & MacDonald Dettwiler Might Just Have Received $50Mln CDN for an RCM Data App," the current Justin Trudeau liberal government has recently announced a new addition to RCM requirements in the form of an upgraded PR2 ground facility, at an initial cost of $48.5Mln CDN, with an option for further improvements and additional costs of up to $63.1Mln CDN, somewhere down the road. But according to Kabatoss, the new facilities are needed. 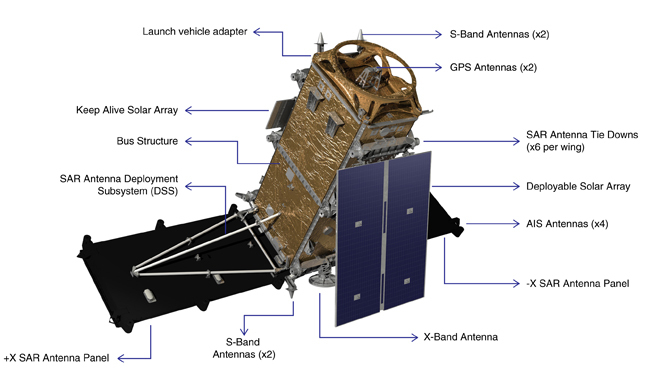 "There are three satellites, with three times the data, plus the requirement to collect and correlate the automatic identification system (AIS) data from RCM, a new system which wasn't part of RADARSAT 2, and combine it into a coherent whole. The requirement for ground stations has simply expanded to reflect the additional information which RCM is expected to provide." AIS is an automatic tracking system used on ships and by vessel traffic services (VTS) for identifying and locating vessels by electronically exchanging data with other nearby ships. Ships not transmitting AIS data are likely trying not to be seen. One of the real challenges of Polar Epsilon, according to Kabatoss, is to relate the AIS data to the synthetic aperture radar (SAR) data, which RCM also collects. "Anyone visible on SAR, but not transmitting on AIS, is worth taking a closer look at," according to Kabatoss. Which is all well and good. But it seems there may be other RCM contracts coming down the pipeline over the next little while and, much like a nontransmitting AIS ship, these upcoming contracts are also trying not to be seen. Let's see if we can do the taxpayers a favor, and try to change that. We might even end up saving a little bit of government money, which could be redirected to some of the smaller players in our space industry. Interesting. However, scope creep isn't exactly specific to government. Project managers are well acquainted with it from customers of all sorts, as well as their company's own sales & marketing departments. Anybody that's done home renovations is certainly familiar with "in scope" and "out of scope" issues. I'm all for saving a wasted dollar, but I'd also be careful to look at the cost-benefit analysis. If spending $1 on SAR + AIS saves $10 in existing or growing costs, it's a bargain, whether that is reduced patrols, sending out helicopter, or transferring costs to domestic law enforcement with contraband, security risks, or other nefarious things a "hidden" ship brings. I'm more interested in what is/was known and planned vs missed vs pivot on new circumstances. AIS potential was identified on RCM on the 2010 CSA RADARSAT Next Generation Options Study, and then analyzed in the 2011 AIS feasibility project with CSA and DRDC (specifically the Radar Exploitation Group). That early feasibility study ended March 31st, 2012. The RCM contract was signed in January 2013, undoubtedly after months of negotiation and process. Given the low planning state of the AIS at that point, I suspect it wasn't even a fully developed idea and items like this necessary facility weren't available anywhere near the contract signing. Sounds like a pivot to wire in a new home security system while the contractor is already renovating the attack into a new loft. Is it worth it? Perhaps it is. Perhaps you are right and it isn't. Need more input. Very interesting topic. 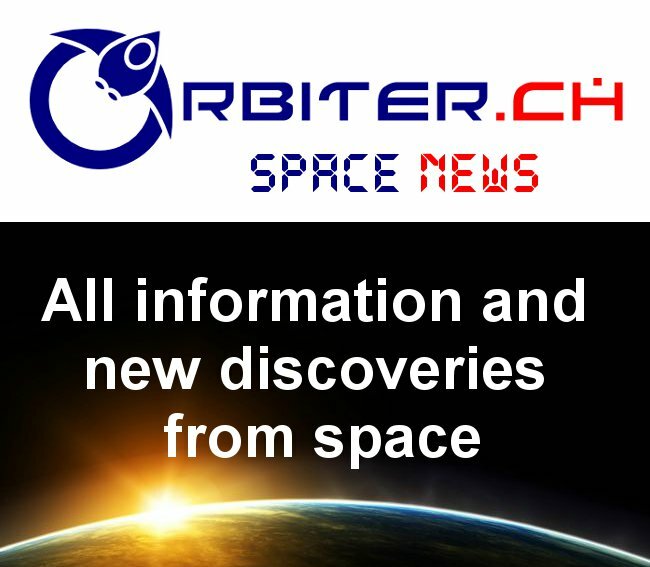 5 new planets have been discovered & the orbits of 4 others known have been precisely defined after 20 years of observation. All periods of revolution between 15.6 & 40.4 years, with masses ranging approximately from 3 to 27 times that of Jupiter.